The Jim Moran Institute will sponsor the travel for up to three student entrepreneurs to attend the Florida Venture Forum’s Early Stage Conference and Student Business Plan Competition on May 13th and 14th in St. Petersburg. The competition will be held on May 14th in the morning. Students will arrive on the 13th so that they can also attend an excellent Post Investment Seminar, hosted by the Angel Capital Association from 1:30-5:00p.m. – a most valuable component of the conference. If you are interested in this opportunity, please contact Mk Haley. Join the Florida Venture Forum for the 8th Annual Early Stage Conference and the 5th Annual Statewide Collegiate Business Plan Competition on May 14th 2015. 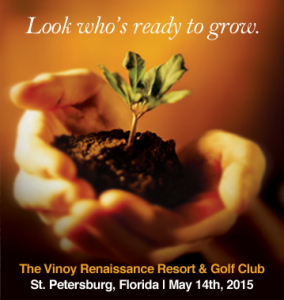 The Forum will be hosting at the Vinoy Renaissance Resort & Golf Club in St. Petersburg, Florida. Listen to some of the most dynamic early stage companies in Florida and network with potential investors. The 8th Annual Early Stage Conference will feature expert panel discussions, exclusive networking opportunities, featured speakers and many of Florida’s top entrepreneurial companies. The Early Stage Conference highlights early to mid-stage investment opportunities throughout the State of Florida. Past Presenters have attracted more than $20 Million in investment capital. For more information on the conference, please visit the 2015 Early Stage Conference website. On May 14, 2015, the Florida Venture Forum, a not for profit organization established in 1984, will host its 5th Annual Statewide Collegiate Business Plan Competition to coincide with its 8th Annual Early Stage Conference at the Vinoy Renaissance Resort in St. Petersburg, Florida. The Florida Venture Forum is now calling on graduate level universities in the state of Florida to bring their best candidate to compete before a panel of judges to win placement as a presenter in the 2015 Early Stage Conference. The Statewide Collegiate Business Plan Competition, has given students the opportunity to raise their level of real world professional focus and funding for their ventures. To date, winning competitors have raised nearly $2.9 Million in funding. More information about the Business Plan Competition can be found at Statewide Collegiate Business Plan Competition. If there are any excellent students or student teams that are ready to compete at this level – it is for both graduate and undergraduate students who will compete against each other. The Jim Moran Institute For Global Entrepreneurship is excited about this learning opportunity, networking experience and high-level of competition, and wants to send the students who would benefit the most.